The bust of a 26th dynasty prince that was stolen from the Egyptian Museum in Tahrir during the 2011 revolution is returning to Egypt tomorrow from Belgium. Minister of State for Antiquities (MSA) Mohamed Ibrahim said in a statement that the bust was stolen from the Egyptian Museum in Tahrir on 28th January 2011 in the midst of the revolution and the lack of security that overwhelmed the whole country. Thugs and vandals broke into the museum from a glass window on its roof, damaged showcases and stole some of the museum's collection, he said. Some of these objects were retrieved while others have remained missing, including this bust. 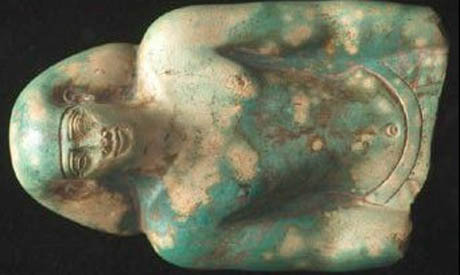 Ibrahim explained that the bust was recognized in an auction hall in Brussels by a French archaeologist who carried out studies on it at the Egyptian Museum in 1989. He immediately informed the Egyptian embassy in Brussels, which in turn reported the case to the MSA. Ahmed Ali, director of the repatriation of stolen antiquities section in the MSA, told Ahram Online that the bust is documented in the archaeological files of the Egyptian museum. It was discovered in 1858 in Giza. The bust is 29 centimeters tall and inscribed with the name of its owner, a prince and official. What a wonderful day when precious and irreplaceable remains of ancient cultures that have been lost to science and humanity are returned to a place of safety and to where it belongs! All to often timelines of an archaeologist digs have already been destroyed by robbers plowing through the layers with disregard for the historic record and respect for the dead.